Our January update brings you a fine example of the much admired and coveted "The Last Supper". 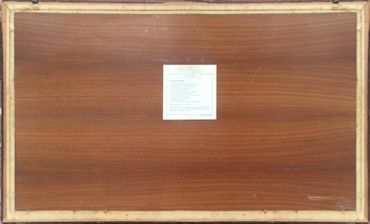 This is the larger version of the Buchschmid and Gretaux "The Last Supper" wood inlay picture. This picture measures 36 x 20 inches (or approx 91 x 51 cms) which, according to the late Herr Otto Chlup of ABC Studios, Heidelberg, makes it one of those rarer examples of this popular work. The owner of the picture, Ronnie Jackson, informs us that after owning the picture for some 37 years, he is reluctantly forced to offer it up for sale. If anyone is interested in negotiating for the purchase of this picture from Ronnie, just let us know and we will put you in touch with Ronnie, where you can then conduct the purchase between yourselves. We, the Marquetry Society, does not get involved in these private sales - all we do as a favor to our web visitors is put you in touch with each other so that you can conduct your sale and purchase on a one to one basis. 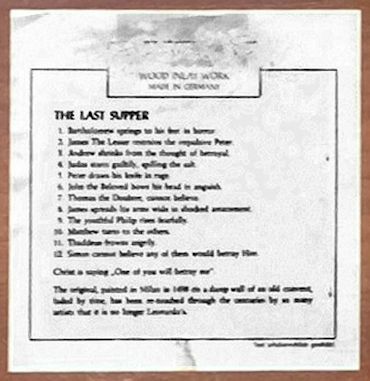 Getting back to this picture, Herr Otto Chlup did inform us that the large versions of The Last Supper picture were made to special order. These were intended for very prominent and important people of the time. The time being from the 1940s to the 1960s. Four of this large version of The Last Supper are known about, but as these Buchschmid and Gretaux wood inlay pictures were usually made up in batches of between six to ten - there could be anywhere between two to six examples of the large "Last Supper" picture still in existence. 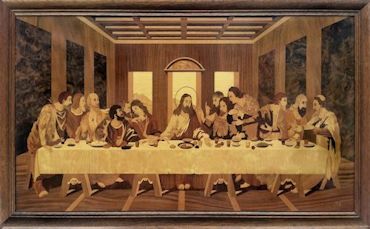 Several years ago one of these larger Buchschmid and Gretaux "The Last Supper" wood inlay pictures sold for over $2000 at auction. Obviously condition will play a part in the price one of these rare pictures will attain, but rarity value will also have an influence. It is amazing to realize that some of these B & G wood inlay pictures often end up being thrown away in rubbish skips due to house clearances and suchlike, simply because the "new" owners (mainly due to bereavements etc) do not realize the value of these important wood inlay pieces. There are no more being made, so each one lost makes the others rarer commodities. Around about five years ago one of the copies of this picture appeared in the EBay auctions. Unsurprisingly there was heated bidding for this desirable piece, and eventually it finally went "under the hammer" for well over $2,000. As we say, that was about five or more years ago; so, it could be well assumed that the value of the picture would have increased accordingly since then. Although, with today's financial market being in its somewhat delicate position, we would advise you to review the perceived values of such art works accordingly and wait until the markets recover in order to ascertain the correct and true values of such works. Click the above button to return to page 68 of "Can You Help"